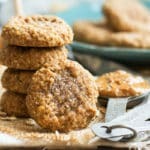 A gluten-free, dairy-free, and refined sugar-free recipe for almond butter oatmeal cookies that is made with only 4 ingredients. These flourless oatmeal cookies are kid-approved and healthy enough to eat for breakfast! What a cookie!! I never quite believed people when they posted recipes about “3-ingredient peanut butter cookies.” However, it is totally possible to create a delicious cookie with minimal ingredients. Wanting to make tese Almond Butter Oatmeal Cookies with a little bit more substance, I decided to add some quick-cooking gluten free oats. Oftentimes when Cohl is out for a long distance run or bike ride he really wants something with balanced nutrition… protein, fat, complex carbs and simple carbs. 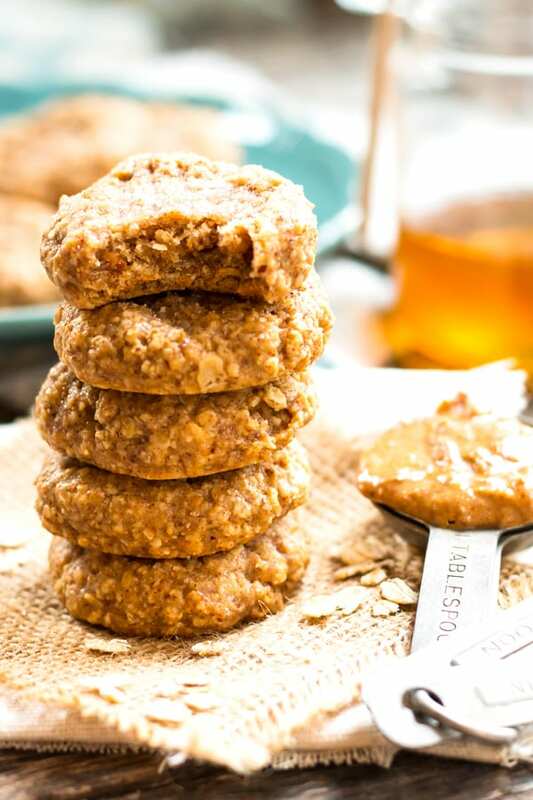 These almond butter oatmeal cookies can help you perform better athletically as well as sustain a high level of activity for longer. 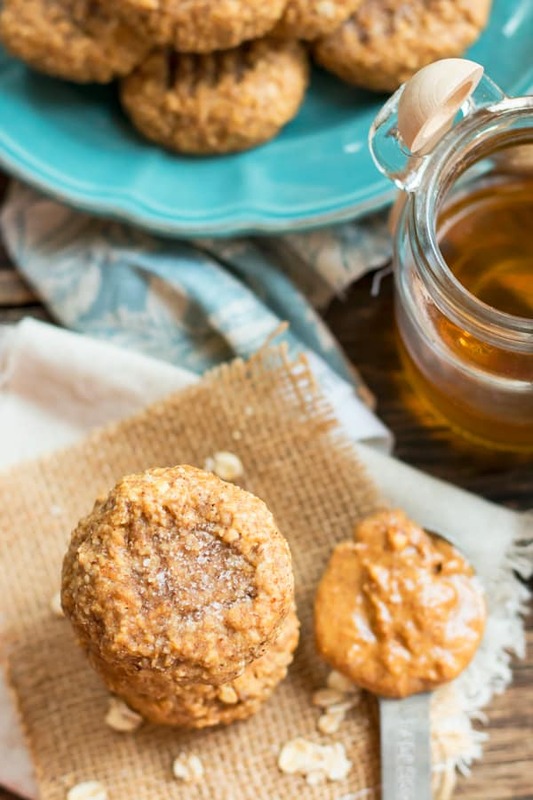 Want to know the four ingredients in these Almond Butter Oatmeal Vookies? Yup, that means these are flourless and refined sugar free oatmeal cookies, too. Honey is a wonderful sweetener when you use it in the right proportions. 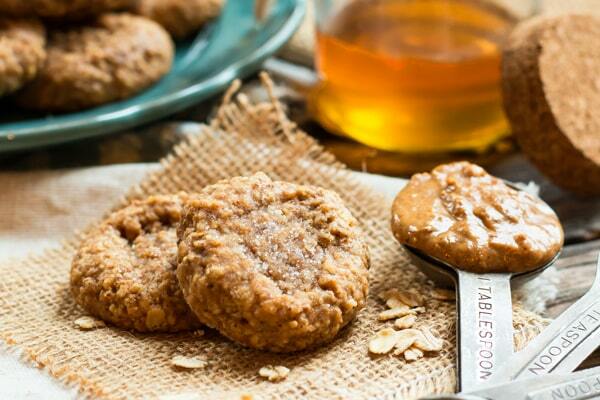 In these almond butter oatmeal cookies, the honey complements the nut butter perfectly. If you happen to be vegan, feel free to substitute the honey for either agave syrup or maple syrup. The flavor may be a little different, but they will still turn out great! Want to know the best part about these almond butter oatmeal cookies? They can be prepared and baked in under 15 minutes! This is fast enough to appease your inner cookie monster whenever he starts growling. Hope you enjoy! A super easy almond butter oatmeal cookie recipe that is made with only 4 ingredients! Roll dough into 1 ½ - 2 inch balls and then place on a parchment paper-lined baking sheet. Place criss-cross fork marks on top of the cookies and sprinkle with sugar (optional). Bake in preheated oven for 10 minutes. Enjoy! *Make sure you use a super creamy almond butter, like the one in the pictures, to get the best results. **If you are vegan, substitute one flax egg for the regular egg, and use maple syrup instead of honey. 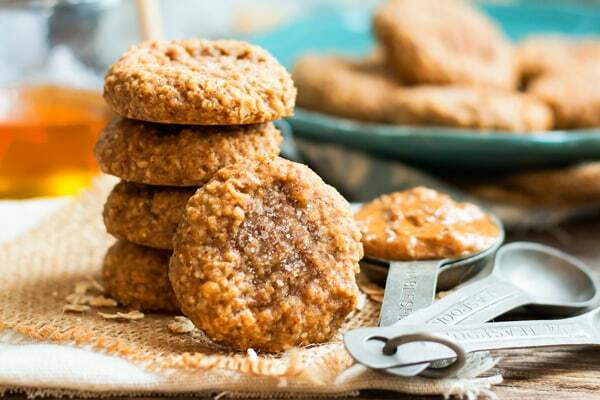 Want more recipes like these Almond Butter Oatmeal Cookies? I love using nut butters in cookies, they are always so delicious & moist. Definitely going to be making these. These are delicious and since I like almonds more than peanuts, they are my favorite nut cookie! Absolutely!! Just wrap them tightly in wax paper and place in an airtight zip-top bag in the freezer. I would first thaw them in the fridge and then to room temperature when defrosting. The texture may change a bit, but they should still taste great! Just made these tonight with a slight alteration and even the hubby agrees – they’re bomb!! Oh that sounds awesome, Lindsey!! I love the addition of the goji berries! Thanks so much for letting me know your alterations and for your sweet comment! Ohh can’t wait to try these! I love how simple the ingredients are! These are AMAZING! I made them with Goji berries (per another users advice), added a few 85% cacao chocolate chips, and use a tiny bit less than 1/2 cup of maple syrup and they came out AWESOME! Very healthy alternative to normal cookies and a great on-the-go snack! Oh that sounds absolutely amazing!! I love those additions 🙂 Thanks so much for commenting! I found these dry and pretty tasteless. Sorry to hear that, Pam. I have found the type of almond butter you use make a HUGE difference. Mine is super soft and pretty oily so it softens up the cookies nicely. Hi May! The cookies can be a bit sweet to some. You can try coconut oil or milk in place of some of the honey, but it will definitely change up the texture. Let me know if you try it out! 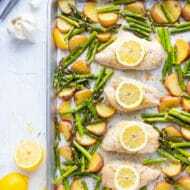 Is there a way to Pin this recipe?!?! These were great. Only had peanut butter and they still were very tasty. I baked mine for nine minutes for my oven and they came out perfect. Could be the reason one of the comments said they were dry was over cooking. Thanks for a quick and yummy recipe! You’re so welcome! That’s great to know that PB works wonderfully, too. Thanks for the comment and feedback! Just made these. They are sooo yummy! Love them. Unfortunately the ingredients are quite expensive here in Germany, because we don’t have almond trees and our maple trees just don’t like to give any juice 😉 …but oats and flax at least 🙂 So will make them again. Thanks for sharing. How long can one batch last? Hi Samia! One batch will last at room temperature in an airtight container for 3-4 days or in the refrigerator for 5-6. Thanks for the question! I made these and they were delicious!! Chewy and not too sweet, great recipe! Hi Krista! So happy you enjoyed them. Thanks for your comment and rating! So happy you enjoyed them, Nicky. Thanks for your comment! I’m making these now. I used unsalted raw almond butter. It needs a little added salt. Also trying rolling them in cocoa powder before baking. What a great idea, Samantha!! Will definitely need to try that out! Thanks for your comment and rating! These were amazing! I added some shredded coconut as I did not add coconut sugar. Very satisfying cookie and I love that they Are quick to make and only dirties one bowl. This is now a go to cookie recipe. The almond butter oatmeal cookies are pretty good. I did have to add a little flour to them though, as they were too runny without the 1/3 cup flour. But they are good, and filling. So happy you enjoyed them, Andrea! It totally depends on how oily/not oily your almond butter is, but glad to hear it worked out with a touch of flour!